CreatineMegabol Creatine Alkaline - 120 kaps. CREATINE ALKALINE the latest generation creatine supplement, drawn up in strict conformity with the description of United States Patent 6,399,661. Preparation facilitates transport of the phosphorus compounds used for the synthesis of the protein. CREATINE ALKALINE the latest generation creatine supplement, drawn up in strict conformity with the description of United States Patent 6,399,661. Preparation facilitates transport of the phosphorus compounds used for the synthesis of the protein. Creatine maintain an appropriate level of ATP (adenozynotrójfosforowy acid) in muscle, allowing muscle fibers to work at the highest level during intense workouts. Creatine is involved in building lean body mass and increases the athlete's muscle strength. 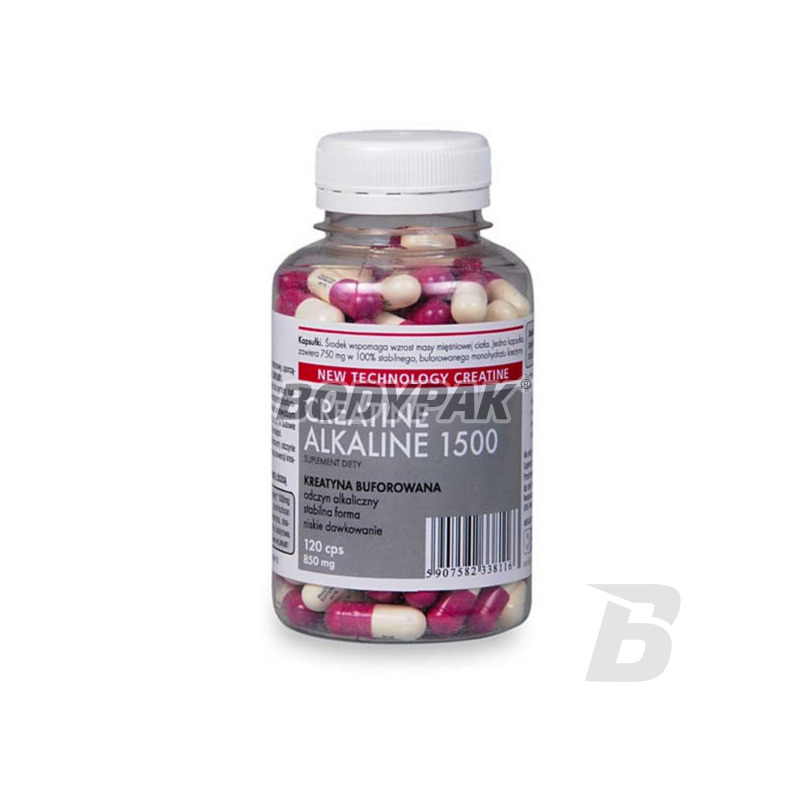 CREATINE ALKALINE is a form of creatine with high pH. According to the patent publication, this feature will reduce the conversion of creatine into creatinine, and its greater stability in solution. Creatine products having alkaline pH have a distinctive element in its name: -Alkaline, -Alkalyn, -Alkatech. 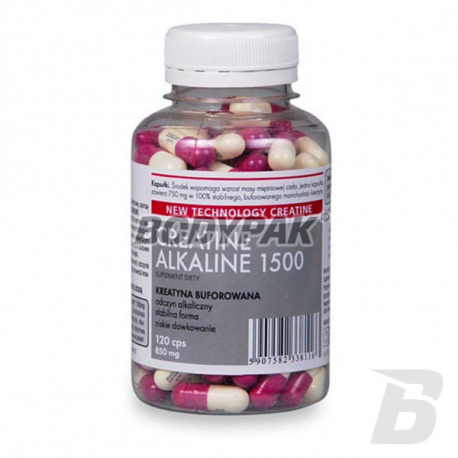 ALKALINE Creatine is produced in the form of special capsules. The capsules play an important role by transporting the active ingredients into the stomach unchanged. Capsules CREATINE ALKALINE created exclusively for the needs of this product have marked - REACTION BUFFERED, or buffered pH. In the case of buffered creatine such a solution seems more appropriate than using a standard white capsule. 2-4 caps. Twice a day. Ingredients: buffered creatine monohydrate (creatine monohydrate, sodium carbonate, maltodextrin, magnesium glycerophosphate, natural identical aroma), magnesium stearate - anti-caking agent, pork ginseng - capsule shell. Creatine Alkaline stosuję od wielu lat.Dla osób pragnących zwiekszyć mase a przede wszystkim siłę to idealny produkt.Jest tani,ale bardzo skuteczny.Kapsulki nalezy popic okolo 200-300 ml wody lub soku .Polecam.